Do as much or as little as you like at the Surf Hotel Beach Club on beautiful Lefkas. The great thing about this holiday is that it’s up to you – there’s a range of included activities to try, or alternatively you can relax and sit back in the sun, doing nothing more than watch the world go by with a drink in your hand – each day you will have this difficult choice! The island is famous for its watersports, due to the warm and pleasant prevailing winds it enjoys. Windsurfing and sailing tuition is included if you fancy giving them a go, or alternatively you could hop on a mountain bike to explore the local area, or try out a kayak, sail board or Paddle board. The Surf Hotel Beach Club sits right on Vassiliki Beach. The laid back Surf Hotel Beach Club features a beach bar serving drinks and snacks, and swimming pool which looks straight across to the sea, and onto the impressive mountains that surround Vassiliki Bay. Sun loungers and comfy chairs provide perfect calm as you sip a drink and watch the world go by! Free Wi-fi is available throughout the hotel. All the comfortably furnished rooms have a private balcony air-conditioning, satellite TV and fridge. 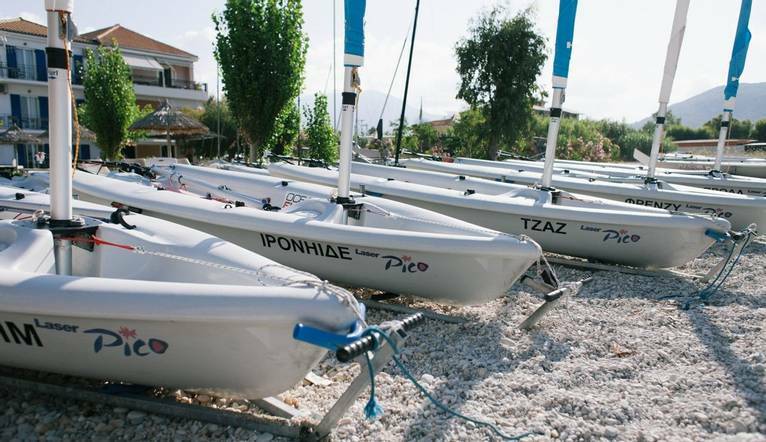 The transfer time from Preveza Airport to the Surf Hotel Beach Club is approximately 1 hour 25 minutes, depending on weather and traffic. Optional tours may be available to you depending on the time of year and numbers interested. All tours can be paid for in local currency but in cash only. The exact amount will be given at your Information Meeting. Your Tour Leader will help arrange these for you but may not necessarily accompany you. We suggest a Group Collection to cover transfer drivers, and hotel staff of €20.00 per person. Your Tour Leader will collect this on your behalf and distribute it accordingly, thus relieving you of the burden of who, when and how much to tip. The tipping of housekeeping will be left to your individual discretion (a small amount left in your room on departure should cover this and would be much appreciated). As is customary, ‘the hat’ will be passed around for the driver and guide on all optional excursions. For any meals that are not included in your itinerary, or taxi fares, your Tour Leader can advise of an appropriate add on.